Hugh Latimer was born in around 1485 at Thurcaston in Leicestershire. He was educated at Cambridge University and in 1510 he was elected a Fellow of Clare Hall. Up until the age of thirty he was a convinced Roman Catholic, later describing himself as ‘obstinate a Papist as any was in England’ and he said ‘All the Papists think themselves to be saved by the law, and I myself was of that dangerous, perilous, and damnable opinion till I was thirty years of age. So long had I walked in darkness and the shadow of death’. His attachment to Roman Catholicism was so strong that he was elected to the office of cross-bearer in the religious processions of the University and held the office for seven years. Latimer was brought to a knowledge of the truth of God’s Word by Thomas Bilney, who was also a student at Cambridge. Bilney believed that Latimer was a sincere and honest man, and that his zeal for Roman Catholicism might be due to a lack of knowledge. After Latimer had spoken out publicly against the Lutheran Reformer, Philip Melanchthon, Bilney visited him in private where he explained to him his own faith. Latimer wrote: ‘I learned more by his confession than before in many years’. From this time on Latimer began to study the Word of God. Alongside Bilney, Latimer began visiting the sick and those in prison. He began preaching in the University pulpits in Cambridge and became famous as a striking and powerful preacher. However, his forthright Biblical preaching soon attracted opposition and the Bishop of Ely banned him from preaching in the University pulpits in Cambridge. He was summoned to appear before Cardinal Wolsey and Bishop Tonstall of London, on a charge of heresy. 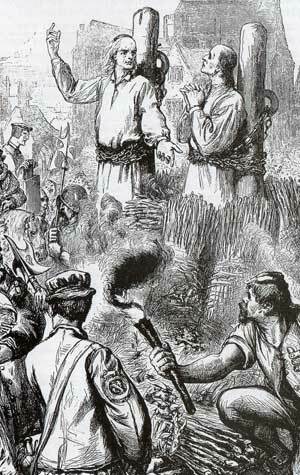 At this time he escaped the stake, his friend, Bilney, was not as fortunate, and he was burnt at the stake in Norwich. Latimer had spoken in favour of King Henry VIII’s divorce, and this had brought him to the notice of the King, who in 1530 appointed Latimer one of his Royal Chaplains. He preached before the King on a number of occasions. In 1531 he was appointed the vicar of West Kington, near Chippenham in Wiltshire. Here he was a diligent preacher but his work was opposed by many of the clergy in the area. For a time he was excommunicated and imprisoned, but in 1535 he was appointed the Bishop of Worcester by the King. John Foxe wrote of his work as a Bishop: ‘the days then were so dangerous and variable that he could not in all things do what he would. Yet what he might do, that he performed to the utmost of his strength, so that, although he could not extinguish all the sparkling relics of old superstition, yet he so wrought that they could not be taken away, yet they should be used with as little hurt and as much profit as might be’. In 1539 Latimer resigned his Bishopric due to the enactment of the Six Articles which made compulsory some of the leading doctrines of the Roman Catholic faith. Latimer had opposed these strongly and in the last year of Henry VIII’s reign he was in prison in the Tower of London for heresy. When Edward VI became King in 1547, Latimer was released from prison and was again offered the position of Bishop of Worcester. Due to old age he declined the offer and spent the next six years of his life working alongside Archbishop Cranmer in the Reformation of the Church of England. In the early part of King Edward’s reign he preached constantly before the King. In the latter part of his reign he preached in the English Midlands, especially around Lincolnshire. A historian has written that ‘Latimer, more than any other man, promoted the Reformation by his preaching’. When the Roman Catholic, Mary Tudor, came to the throne, Latimer was one of the first of the Reformers for whom an arrest warrant was issued. When he was arrested he was preaching in Warwickshire. He was imprisoned in the Tower of London where he shared a chamber with the other Protestant Reformers Thomas Cranmer, Nicholas Ridley and John Bradford. What were some of Latimer’s views? On Scripture he said: ‘A layman, fearing God, is much more fit to understand holy Scripture than any arrogant or proud priest; yea, than the Bishop himself, be he never so great and glistering in all his pontificals ... Let the Papists go with their long faith. Be you contented with the short faith of the saints, which is revealed to us in the Word of God written. Adieu to all Popish fantasies. Amen! For one man having the Scripture, and good reason for him, is more to be esteemed himself alone, than a thousand such as they, either gathered together, or succeeding one another’. Latimer was moved from the Tower of London to Oxford in 1554 and there on 16 October 1555 he was burnt at the stake alongside Nicholas Ridley. At the stake he said his famous words to Ridley: ‘Be of good comfort, Master Ridley, and play the man; we shall this day light such a candle, by God’s grace in England, as I trust shall never be put out’. I end this account of Hugh Latimer’s life with quote from Bishop J C Ryle, amended to suit our local circumstances: ‘The name of Bishop Latimer is well known to all readers of English Church History ... But Orangemen ought to know these things better in the present day. They ought to become thoroughly familiar with the lives, the acts, and the opinions of the leading Reformers ... My desire is, that men may understand that the best interests of this country are bound up with Protestantism. My wish is, that men may write on their hearts that the well-being of England depends not on commerce, or clever politicians, or steam, or armies, or navies, or gold, or iron, or coal, or corn, but on the maintenance of the principles of the Reformation’.